Yesterday I took a cycle south on the National Cycle Network route 1. I headed out on the Lasswade Road, towards Bonnyrigg, where I joined the NCN1. It was quite a nice day, with some awesome views in parts of the route. One of the great things about being on a push bike, is that you can ignore “Road Closed” signs, instead of taking a long diversion. In this case, a bridge on the National Cycle Network was getting replaced. Though there was a temporary scaffold bridge available for use by cyclists and pedestrians. Parts of the journey were quite tough, even so they were downhill on quiet roads, there was a strong head wind. At Innerleithen, I stopped for a short break to grab a pizza, so that I would have enough energy to get back home. From there the cycle route starts heading east to Galashiels and Melrose. After Melrose, I decided it would be better to head back home rather than continuing south on the national cycle network. At that point I seen a distance sign that said that Edinburgh was 39 miles away on the A68. At that point I predicted that I’d be home some time between 12 midnight and 1 am. As I was heading up the first part of the A68, which was quite a bit of uphill, I was starting to extend my prediction as to the estimated time of arrival home. However the downhill at the other side made up for the extra time to get up the hill, with me arriving home around quarter past midnight. 96 miles in 9 hours 45 minutes is pretty good, with a few breaks. It is however only a third of the speed required for setting some UK Road Records. While I was out on my travels, I collected a nice track log of my journey, so that I could add it to OpenStreetMap.org. 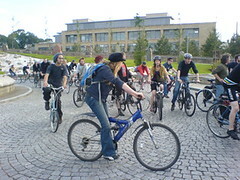 This entry was posted in Cycling, Edinburgh, Midlothian, Scottish Borders on August 5, 2007 by smsm1986.